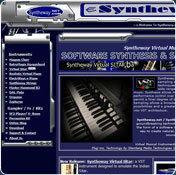 Virtual Room Emulator is a VST reverb plug-in for native PC platforms. Used to create psycho-acoustic models in the DSP environment. It simulates the reverberation of a sound in a rectangular type room, allowing separate control of the room's width, depth and height. It also allows you to control the distance between the listener and the sound positioned in that virtual room. The Virtual Room Emulator section offers control over the size, width, and damping factor of the room by way of three linkable sliders. Produces a natural sounding room reverberation effect that gives you true room perception, from small rooms to large concert halls. Small rooms have a high percentage of early reflections ( the first feedback from the closest objects) that can give more body to tracks. It is also good with acoustic guitars and voices. Larger rooms are better with wind instruments, synthesizer pads or strings. · Reverberation technique that simulates a real acoustic environment of a room. · Separate control of Room's dimensions, produces naturally sounding reverberation. · Early and late reflections, (The sound reflections from walls, floors and ceilings following a sound created in an acoustically reflective environment). · Damping to re-create a realistic room (In the context of reverberation, damping refers to the rate at which the reverberant energy is absorbed by the various surfaces in the environment). · It uses reverberation engine that does not produce metal harmonics. · 32-bit sound processing with sample rate of 96kHz. · 16 predefined room configurations that range from tiny to extra large rooms , allow you to quickly switch between different Virtual Room's configurations. · Processor: Pentium, Celeron or equivalent - 500 MHz or more. · Work with other hosts, as a DirectX plug-in using the FXpansion Vst-Dx V3/4 adapter or running ToneWise's DirectiXer 2. Is the easiest way to gain access to the hundreds of VST plug-ins from your DirectX audio application. Compatible with the Cakewalk Audio line (v6 and higher), FASoft N-Track, Sound Forge and Vegas (as an Aux effect only, in Vegas), Acon Digital Media Acoustica 4.0 (Effects only) Syntrillium Cool Edit Pro, and many more. · Via FXpansion's VST-to-RTAS Adapter: M-Audio Digidesign Pro Tools M-Powered Recording Software. · Via FXpansion's VST to AudioUnit Adapter for Mac OS X: A highly-integrated plug-in wrapper that allows users of AudioUnit-compatible applications to integrate VST plug-ins and instruments seamlessly in to their working environment. · An ASIO soundcard is recommended for low latency real-time play. You cannot download any crack or serial number for Virtual Room Emulator VST on this page. Every software that you are able to download on our site is legal. There is no crack, serial number, hack or activation key for Virtual Room Emulator VST present here. Our collection also doesn't contain any keygens, because keygen programs are being used in illegal ways which we do not support. All software that you can find here is freely downloadable and legal. Virtual Room Emulator VST installation package is prepared to be downloaded from our fast download servers. It is checked for possible viruses and is proven to be 100% clean and safe. Various leading antiviruses have been used to test Virtual Room Emulator VST, if it contains any viruses. No infections have been found and downloading Virtual Room Emulator VST is completelly problem free because of that reason. Our experts on malware detection tested Virtual Room Emulator VST with various spyware and malware detection programs, including fyxm.net custom malware and spyware detection, and absolutelly no malware or spyware was found in Virtual Room Emulator VST. All software that you can find on our servers, including Virtual Room Emulator VST, is either freeware, shareware or open-source, some of the software packages are demo, trial or patch versions and if possible (public domain licence), we also host official full versions of software. Because we want to be one of the fastest download sites on the web, we host all the software including Virtual Room Emulator VST on our servers. You cannot find here any torrents or download links that would lead you to dangerous sites. Rate Virtual Room Emulator VST 1.3!